Hello! 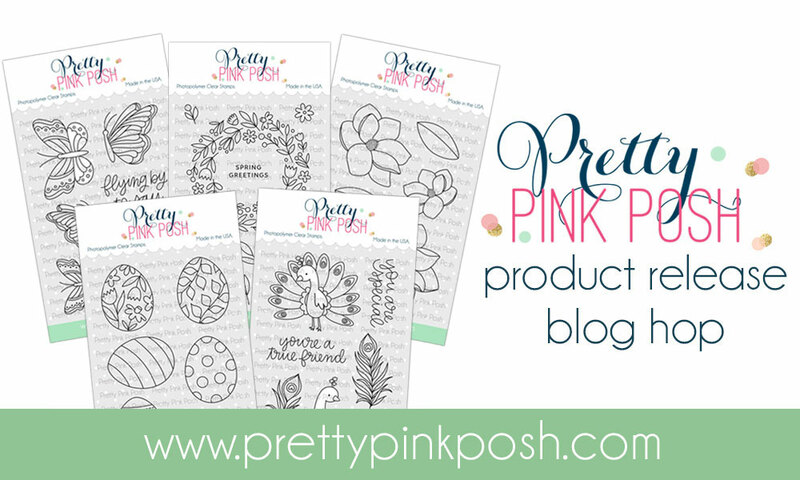 Thanks f or joining me at the Pretty Pink Posh March 2019 Product Release Blog Hop. I am so thrilled to be joining in this month. As you can see by my multitude of cards it was hard just to pick one thing. You cannot go wrong with any of this release and I know I am going to need all of it! 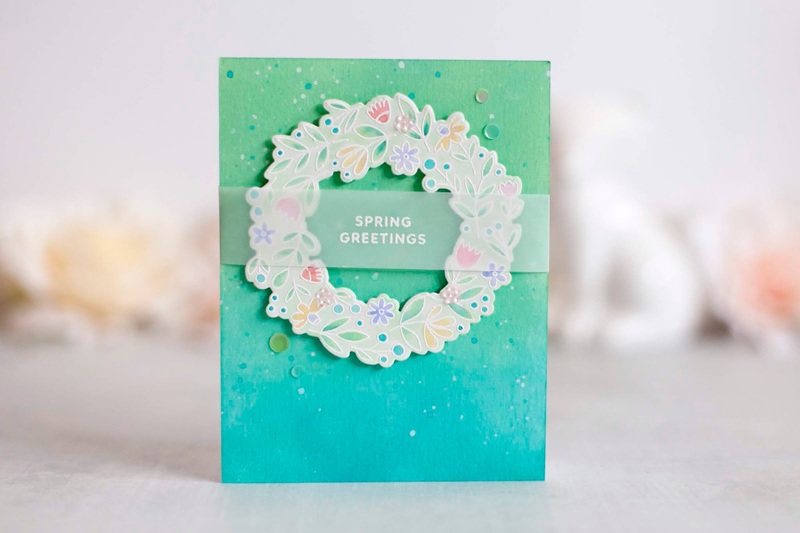 Card 1: For this card I started with the new stunning Spring Frame die. I couldn't resist making a shaker out of it. Just to perfect. I ink blended the background using distress oxide inks in Blueprint Sketch and Shaded lilac and a light misting of water for texture. The sentiment is from another older PPP set Everyday Greetings. A friend of mine has recently gone through some surgery and I needed just the perfect card to send. I think this does the job, don't you? Card 2: For this one I tried something a little different. I white heat embossed the wreath on some water color cardstock before die cutting. Once it was cut I used a few shades of distress ink to watercolor in the wreath. I chose my colors based on the new Easter confetti mix which I also used to finish off the wreath. Instead of leaving the space white between the foliage I used a light wash of cracked pistachio. Aren't the colors just so springy? The sentiment is also white heat embossed, this time on vellum so that the wreath would still show through. The background is done with distress oxides in Cracked Pistachio and Peacock Feathers with a splattering of the same inks along with some white paint. Card 3: For this one I did the background in the colors of distress oxides; Peacock Feathers, Salty Ocean and Wilted Violet. I chose a few copic colors to match and that's what I used on the butterflies with very simple coloring and shading. The sentiment is liquid platinum embossing. I also embellished with a few of the new confetti mix. 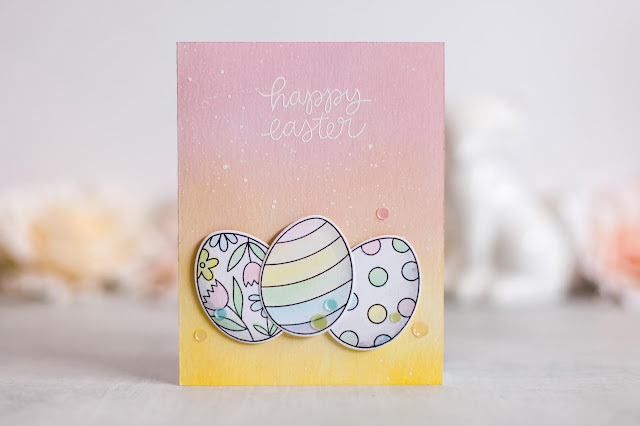 Card 4: And lastly a more pastel card then the previous ones but the colors on this were based around the confetti mix from the background to the eggs themselves. The background is again distress oxides in Warm Lipstick and Scattered Straw. I used a very light wash of watercolors on the eggs, white heat embossed the sentiment and ended with a scattering of confetti. And some more exciting new! As part of this hop there are 4 $25 gift certificates up for grabs (two winners each day). Winners will be picked randomly along the blog hop. Comments must be left by 11:59 PM PST on 3/13/2019. Winners will be announced on the PPP blog. Sharna Waksmulski <--- You are here! Your background shading is really awesome. It sure shows of the die! Beautiful cards! :) Love the butterflies. Fabulous cards!!! They're pretty amazing!!! That background and the wreath! Eek...I’m going to have to make that lol. Beautiful! Lovely cards Sharna! Thank you. Four delightful cards, Sharna! Love your soft coloring! The bright colors of the butterflies and blended background is my fav! Tricia Podmore here,and must tell you that the cards are exquisite, especially the ink blended backgrounds. Thanks for super inspiration. Sweet set of pretty cards! Aren’t these card designs lovely 😊! The cover plate has caught my eye. Love the eggs too. Simply sweet Easter wishes. Thanks for sharing. Simply gorgeous! That wreath is beautiful. And of course, the butterflies are amazing. how beautiful. i love all your cards. . . i don' wanna be at work!!! Wonderful cards. My fave is the one with the butterflies. the leaves against the blue are fabulous. Love the mix of colors on the other card. Beautiful cards! They are absolutely lovely! Gorgeous cards. I am loving the new release and seeing so many wonderful cards. Stunning backgrounds! I love the bright colors! Your cards are so beautiful! I love the beautiful colored backgrounds. Lovely cards! Really like the wreath on the vellum - very creative and pretty! The white embossing looks great. Soft. The variety of your cards really showcases your creativity. Love them. Wonderful job showcasing the new release! The simple blue and white color combination on the Get Well card is so pretty. All four cards are lovely! Wonderfully creative and sweet cards! So lovely! Thank you for sharing your talent and creativity with these cards, they are all beautiful. Lovely cards! Your butterflies are gorgeous! What great cards with this pretty release! Love the colors! Love the designs!!!! All of your cards are beautiful! I love the colors you chose and the beautiful blessing and coloring! Thank you for the inspiration! 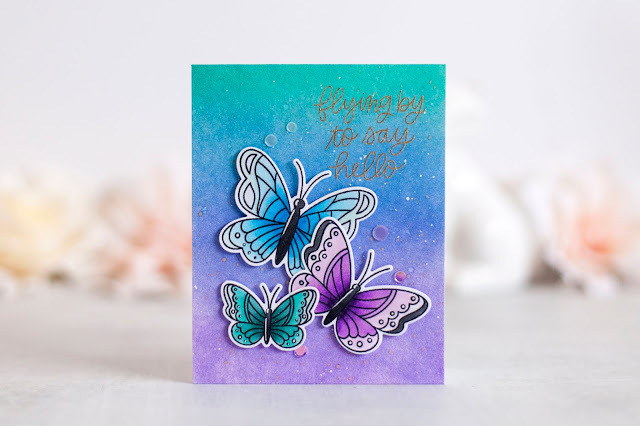 Beautiful cards to show off these new stamps and dies! Love your shaker card with that awesome frame die! Beautiful cards! I love the watercolouring you did on the wreath. It looks beautiful embossed in white. And the colours on the butterfly card are so eye-catching! You created such beautiful cards! Such beautiful cards! I especially love the butterfly card.... those vivid colors really pop off the paper! Beautiful cards. I especially love the shaker. TFS! All your cards are beautiful, such a soft, fresh effect from the colors and backgrounds. SQUEAL!! LOVING the NEW Release and the AMAZING Inspiration!! Such BEAUTIFUL Designs!! THANKS SO MUCH for sharing and have a FABULOUS Weekend!! Your cards are so beautiful! The colors are dreamy! I love all these new products from PPP. Love the eggs! Love the soft look you gave the eggscard! Wonderful new release, great cards and the colors are perfect. Thanks for sharing. Beautiful cards. Your backgrounds are stunning. Wow! Really beautiful coloring on the backgrounds!! You could easily use these them for any occasion! Each one is very beautiful and really "sets off" the new PPP products you used. Great job! I love all three of your cards, but my fav is actually the Easter card. So simple and sweet! Lovely cards - your backgrounds are gorgeous! 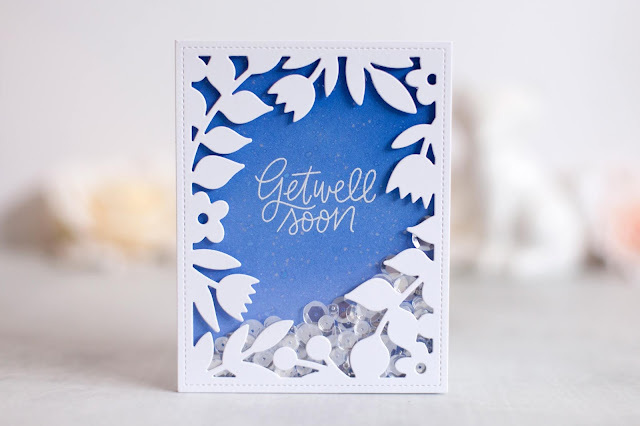 Gorgeous cards...love the way your backgrounds emphasize the pretty dies and stamps. Such sweet cards! I love that wreath stamp. You definitely know how to blend to maximum effect! I love the colors you've chosen; they perfectly complement your focal images. I particularly like the cracked pistachio behind the spring wreath. Thanks for sharing all these lovely ideas! The blended backgrounds on your beautiful cards is stunning. Love the colors on your cards. They are so sweet and beautiful. Your ink blending is so perfect 😍😍 and love how you made a variety of cards from sinple to elaborate! All of your ink blended backgrounds are stunning! Love them all!